The “Olivia Bib” from Severn Sailing Association. Most in the US sailing community are aware of the tragic drowning of 14-year old Olivia Constants in a club-supervised practice in Annapolis in June, 2011. 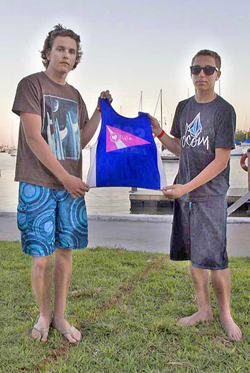 Olivia and her skipper were part of their club’s Club 420 Travelling Team that raced against other clubs in the Chesapeake Bay area. The drowning was caused by Olivia’s trapeze gear becoming “caught on something,” which held her underwater. Noted sailing author John Rousmaniere presented a detailed report of the accident at the USSailing Annual Meeting in late October 2011. In that report, John mentioned Long Island Sound Coach Steve Keen as having had similar but not fatal experiences. Steve is the Director of Sailing for LISOT – the Long Island Sound Youth Sailing Team, and its head 420 Coach. Coconut Grove Sailing Club hosted its 49th Annual Open Orange Bowl Regatta this past December 27-30. 29ers, International 420’s and Lasers were the invited classes, of which the first two are trapeze classes with young sailors. Consequently, in view of the timing as the first major trapeze class event following release of the USSailing report, it was appropriate to present the latest thinking about trapeze safety to the entrants, their coaches and parents. 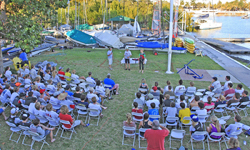 Coconut Grove Sailing Club’s Safety Clinic was conducted in association with its 49th Annual Open Orange Bowl Regatta on Monday, December 26th 2011 at 4:30 pm on the Lawn at the Club. Attendance was mandatory for 29er and I-420 entrants in the CGSC Open OB Regatta. Their coaches and parents, the entrants in the Club 420 Class Coral Reef YC OB International Youth Regatta and their coaches and parents were also invited. The event was very well attended, with seating on the lawn and also on the upper deck of the Clubhouse behind the railing facing the Lawn. Coconut Grove Sailing Club Commodore Ron Rostorfer welcomed the attendees and stated that the reason for the Clinic was the tragic fatality involving Olivia. The attendees then stood and observed a moment of silence in respect for Olivia. Ron proceeded to briefly discuss the evolving nature of both safety and performance-related sailing equipment and the need to thoroughly vet the purposes and potential side-effects of both safety and performance equipment before committing to their use. He then mentioned Coach Steve Keen as perhaps the most advanced trapeze dinghy performance and safety person on the continent in terms of experience and thinking, and proceeded to introduce Steve to carry out the Clinic. Steve’s presentation took about 45 minutes and totally held the attention of the attendees. It was a real achievement in an effort to “stand down” and think about safety while racing in youth-oriented trapeze classes. Make sure you are using your equipment as it was intended and designed, and don't buy equipment expecting to grow into it as it will not fit correctly or function correctly making the equipment unsafe. Make sure there are no rips or anything that is malfunctioning with the equipment. Take the time to think about the systems in your boat and see if there are any unnecessary lines that can be removed. 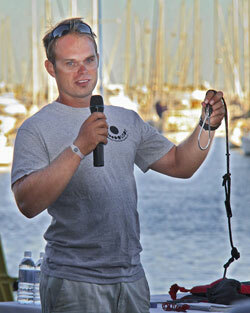 Remove all unnecessary loops in systems and think about the knots you are using in your boat. A bowline will create an additional loop that is not needed, where a "knot on a knot" (a half hitch in the rope with a half hitch around the rope) will do the same job without creating a potential hazard. Is there any hardware on the boat that is not necessary or not best suited for the job it is been used? The first step is to identify when a coach, parent or other support boat is going to be needed for assistance. When one of the above is on the water in a situation, they will need to identify what is normal and what is not normal. -- Yell or otherwise let your teammate and rescuers know you’re OK (perhaps you are under that boat in an air pocket). -- If you can’t be seen and you are OK, be heard. Otherwise, rescuers will take unnecessary risks on your behalf. --When you see a "normal" capsize keep watching as the situation can change in an instant. Once you have identified a situation where you are needed for assistance you will need to make a plan for best success. Before all else, "Rule number 1, look after number 1". You need to make sure you are able to help the sailor or sailors who need your help while at the same time making sure you are safe, so you aren't going to require assistance from someone else. -- Did you see the situation develop? --Did the team capsize, to leeward or to windward? --Did the team nose-dive and capsize over the bow? --Is the kite up or kite down? --What side of the boat was the jib cleated on? --Was the main cleated and in what position? --Were the sailor or sailors thrown from the boat? --What are the sea conditions? --Was there anything strange or different about the capsize? --Are there others who are going to be able to help you with the rescue? --Where could the sailors be if one of both of them did not surface? Once you have made a plan, you then need to act on your plan, keeping in mind your plan may change as information changes or as your environment changes, such as additional rescuers arrive, sea and wind conditions change. If you find yourself in a position where you are needing help, your first step is to remain calm. If you are becoming panicked, control your breathing to bring your heart rate down so you are able to think clearly and help the situation. If your teammate needs help, again remain calm so you are able to help your teammate and others who may be on site offering assistance. "If you become panicked, you are not going to be able to help yourself or anyone else, and you might make the situation worse"
We spend a lot of time on the water in a variety of roles as race officials, spectators sailors and coaches. Keeping an eye out for what is normal and what is not normal will help keep you, your teammate and other competitors safe. There is another group of people out on the water that could need your assistance, the general public. There is a chance you will be needed to help in situation involving non-sailors. Keep in mind, "rule number 1, look after number 1". Photos courtesy of Richard Pober, Yvette Shapiro and Charles Edelstein.